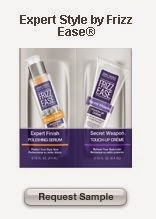 Click the link below to go to the Target website to get a free sample Expert Style by Frizz Ease®. Hurry Target samples do not last very long at all. Once on the Target website click on "Request a free Sample".